Hear people talking about being genderqueer, gender fluidity, gender-non-conforming? They're harking back to this feminist author's seminal work. If you wanted to choose a celebrity avatar for everything supposedly weird about The Youth, you could do worse than Jaden Smith: a gnomic tweeter, sometime crystal devotee, self-described “Future of Music, Photography, and Filmmaking,” who has little attachment to the gender binary. Earlier this year, the 17-year-old son of Will Smith and Jada Pinkett Smith, brother of Willow, appeared in a Louis Vuitton womenswear campaign. 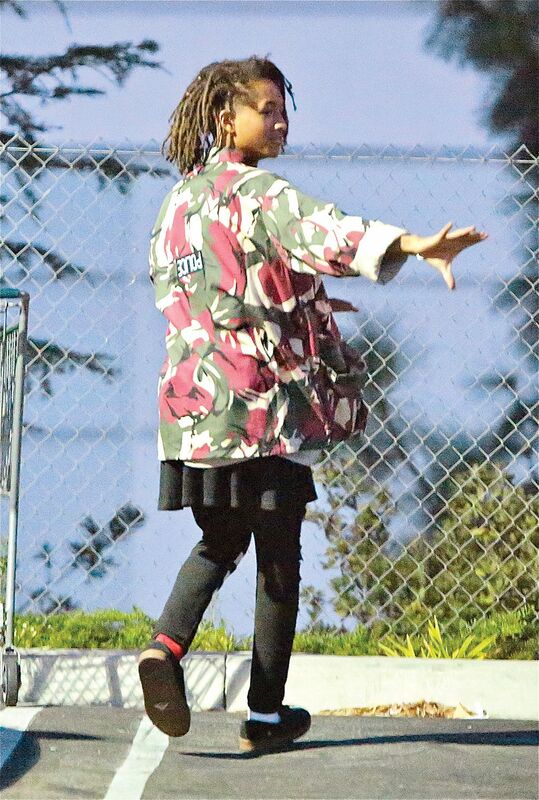 Jaden Smith, quasar of contemporary teen behaviors, wears a fringed white top and an embellished, knee-length black skirt. Wait, though. Rub your eyes, refocus your gaze, and really, is there any real reason why this ought to be weird? He looks good. And gender norms — they are pretty arbitrary, right? Smith also wore a dress, with a loose sport coat and sneakers, when he tookThe Hunger Games’ Amandla Stenberg to the prom. (Stenberg, meanwhile, recently came out as bisexual over Snapchat, though she’s also shrugged at conventional identity politics: “I don’t really see sexuality in boxes,” she has said.) Smith’s insouciant attitude toward gender looks less like affectation than evidence of a world that has changed profoundly in the two decades since his father starred on The Fresh Prince of Bel-Air. Or, for that matter, since his father refused to kiss a man onscreen 23 years ago. Caitlyn Jenner’s coming out last year was a Kardashian-scale teachable moment — the opportunity for patient, prime-time explanations of why not to take gender for granted. But beyond the “transgender tipping point” heralded by Time and the broader awakening of identity politics, there is another revelation going on: a growing acceptance, especially among a broad swath of young people, of easy gender fluidity and ambiguity. In 2014, Facebook stopped limiting its gender options to male or female and began giving users some 50 other choices (from neutrois to genderqueer to cis). In 2015, the site abandoned that preset menu altogether and just let users enter up to ten terms of their own. We find ourselves poised someplace between gender mattering tremendously and mattering not very much at all. The impulse to reexamine assumptions has had practical consequences — gender-neutral college dorms and high-school bathrooms — and cultural ripples. Writers like Jill Soloway (creator of TV’sTransparent) and Maggie Nelson (author of the queer-family memoir The Argonauts) have found human drama in gender’s mutability. Meanwhile, BuzzFeed offers an illustrated list showing “What People Say to Gender Nonbinary People vs. the Subtext We Often Hear,” and Rookie presents the recent comic “My Gender Is Weird.” Here’s Teen Vogue on another photo of Jaden Smith in a skirt suit: “The midi skirt set sends up a poignant rejection of heteronormativity.” What sage could have predicted that heteronormativity would eventually make its way into the vocabulary of teen magazines and shareable web content? Only, perhaps, the queer theorist Judith Butler. Butler laughs when I tell her about the Teen Vogue verdict on Jaden Smith. “I think there aren’t very many of us who could have foreseen it,” Butler says, considering the blossoming mainstream interest in gender issues. We are speaking shortly after President Obama publicly voiced his support for transgender rights in the fight against North Carolina’s bathroom law, and gender — as something in need of definition, as something potentially ambiguous or complex — is at the center of national debate. “Such an utterance coming out of a U.S. president would be impossible in the 1990s,” Butler says. "It was a moment where an academic argument was brought into popular culture." I was watching Scandal the other night,” Butler tells me, “and there was a great moment where a black character says, ‘Oh, race is just a social construct.’" She enjoys observing this kind of cultural cross-pollination. “I thought it was hilarious! It was a moment where an academic argument was brought into popular culture.” (Butler also watches Transparent, which she considers “enormously entertaining” but “much better on Jewish life than it is on trans life. It’s a little bit of a throwback to the La Cage aux Folles idea of transgender.”) This kind of thing happens with some frequency now, and often transcends mere hilarity, as when Laverne Cox talks in interviews about Simone de Beauvoir. “Laverne says, ‘It was that phrase, that one is not born but rather becomes a woman, that made it possible for me to think that I could become trans,’ ” Butler says. “You know, it’s kind of trippy that here’s this popular-culture person who has read and struggled with ideas, and went out into the world, and brought them with her” to reach new audiences. Gender Trouble hasn’t changed — chapters still feel like long-distance runs. And yet completing this feat of endurance today leaves the liberal-artsy reader with a curious sense of lightness. The feeling is not of your worldview’s being upended but rather thoroughly explained. That gender is not an essential biological fact: Sure. That it comes into being through repeated actions, so, like, I become recognisable as a “girl” by doing girl things: Okay. That the world as we know it has generally presumed everyone to be straight; that people who don’t play by the rules, gender-wise, straightness-wise, pay the price; and that, while maybe we can’t totally escape all of this, we can find ways of questioning it, possibly even undermining it, and so making life more livable for everybody: Yeah, sounds about right. Alexandra Kleeman, a young novelist whose book You Too Can Have a Body Like Mine concerns femininity in all its elaborately constructed strangeness, told me about the day early in her first semester of graduate school at Berkeley (where Butler teaches) when she saw the professor sitting on a curb, talking on her phone. Butler was crouched down near the ground; she looked so small, said Kleeman, “and yet she contained all that theory.” In conversation, various Butler admirers and former students I spoke with tried to suggest her presence via celebrity comparison: Bob Dylan, Jon Stewart, Serena Williams. Like many famous people and not many academics, “Judith Butler” is both an exciting idea and an actual person. At 60, Butler has the lean, undeniable elegance of a cross-dressing Shakespearean heroine — a version of androgyny that has less to do with masculinity or femininity than with pants’ being expedient attire. Once, to her amused interest, a German newspaper described her as looking like “a young Italian man.” She wears a lot of black and gray. Her hair is short, side-parted, and falls forward a bit as she talks, requiring her to push it back with both hands. After two years, she transferred to Yale for its philosophy program, where she remained through graduate school. Butler was active in New Haven and Yale women’s groups, and her time on campus coincided with the emergence of women’s studies as an academic discipline. She wrote her dissertation on Hegel and received a Ph.D. in philosophy. "How does “womanhood” get defined; on what assumptions does it depend?" With Gender Trouble, published when she was 33, Butler began articulating a theory of gender that fit into the Continental tradition she’d studied. The book drew on Foucault, Freud, Lévi-Strauss, Lacan, Irigaray, Wittig, Kristeva, and de Beauvoir. (Hegel, Derrida, and Nietzsche lurked in the background.) But Butler begins her analysis in a place that’s recognizably practical: How does “womanhood” get defined; on what assumptions does it depend? And, if a feminist movement defines itself as fighting for women’s rights, whose rights does it have in mind? "If a feminist movement defines itself as fighting for women’s rights, whose rights does it have in mind?" Halberstam, who was in grad school (and genderqueer) when Gender Trouble came out, remembers the book as a revelation, an escape from the “suffocation” of the era’s identity politics. “Academic feminism was riddled with problems at that time based upon these phrases like The personal is political that had led to people sort of sitting around in circles holding hands and telling each other about their lives,” Halberstam says. “Gender Trouble gave people a way of thinking critically, philosophically, abstractly about what it means to be in a political struggle where the category of womanhood, rather than holding together and cohering, might well be splintering and falling apart.” She and her fellow queer theorists were responding to forces already alive in the culture, Butler says, bringing an intellectual framework to bear on the efforts of activists. The following year, the philosopher Martha Nussbaum wrote a long takedown of Butler for The New Republic. Nussbaum took issue with her prose, which she called “exasperating”; she argued that it obscured derivative thought. Most significantly, though, Nussbaum disapproved of Butler’s version of feminism: In her view, Butler was ignoring the “material suffering of women who are hungry, illiterate, violated, beaten” in favor of focusing “narcissistically on personal self-presentation.” Butler’s work, she argued, amounted to an ineffectual, passive, “hip quietism”; “gays and lesbians do not achieve legal protection” through intellectual activity like Butler’s, she added, almost as an afterthought. The complaints of Butler’s critics back in the ’90s and today’s critics of campus p.c. culture share a skepticism at the power of words to shape the world. One of many tributes circulating on the web, this one made by "Hannah, busy Ph.D. student and founding member of the JN fan club." In formulating her idea of gender performativity, Butler had drawn on the work of J. L. Austin, the philosopher of language who first proposed “performative utterances”: These are speech acts that don’t just describe reality but change it, like saying “I do” in a wedding ceremony. Her move was to apply this idea to actions as well as words. But as Austin pointed out, performative acts can still be “infelicitous” — saying “I do” doesn’t change things if the people saying it aren’t allowed to wed. There’s always the element of social context, a need for recognition and reciprocity. Paying attention to matters like pronouns “acknowledges and takes very, very seriously the idea that language matters,” Butler says. At Berkeley, where she’s worked since 1993, Butler is in many ways surprisingly accessible for an academic celebrity. She shoulders a standard teaching load. This means that during the spring semester of 2016, for example, she could be found twice a week in a classroom with 50 undergraduates, leading a 100-level comp-lit lecture on “Dramas of Queer Kinship.” Butler is an easy performer, beckoning students to scoot their chairs forward. Watch her address a crowd and you become aware of how her writing is animated by her presence — if reading her work is strenuous, in person it’s Butler herself, and not her audience, expending energy. Butler came to Berkeley not long after Gender Trouble made her reputation. Part of the Bay Area’s appeal was the prospect of a comfortable place for her to have a family — somewhere to raise a child and have that child feel at home. Wendy Brown, Butler’s partner, is a political-science professor at Berkeley, and their son, Isaac, is now 21. “Once, when he was younger, I said, ‘So, how is it for you having queer parents?’ ” Butler remembers. “He said, ‘That’s not the hard part. The hard part is having two academics.’ ” Isaac has long curly hair and studies music at Wesleyan; in an interview he and his band gave as freshmen, he said his dream date was Beyoncé or Grace Kelly. "The last four years in particular have seen an enormous growth of student interest in identities “beyond the binary"
Isaac belongs to a generation for whom Butler is part of the canon. Today, it is possible to go online and read Judith Butler’s theory of gender performativity as explained with cats. There are Facebook pages like “Judith Butler Is My Homegirl.” Quotes from Gender Trouble are reliably reblogged on Tumblr. And yet, Maria Trumpler, director of Yale’s Office of LGBTQ Resources and a professor of women’s, gender, and sexuality studies, says that for the kids she sees at Yale today, 40 years after Butler was an undergraduate there, Gender Trouble is “really old-fashioned.” The last four years in particular have seen an enormous growth of student interest in identities “beyond the binary,” Trumpler says, like agender, bigender, genderqueer. “When we did all this back then, we were trying to find ways to say and think what had never been said or thought,” Halperin says. The shift from marginal to mainstream can be startling for academics who made their names as radicals. Butler has begun to anticipate the freedom of her eventual retirement from Berkeley. (“Self-care is important, especially as you age,” she says; she goes to yoga twice a week and swims almost every day.) Retirement “deinstitutionalises your work,” she explains. “It doesn’t diminish the amount of work.” Even as society has caught up to the questions she raised about gender, even if in some senses it’s surpassed her, she’s looking toward other, still-thorny issues. In recent years, Butler has been considering how we define the human. Whose lives do we see as valuable; whose deaths are therefore grievable? She’s written on post-9/11 “war on terror” rhetoric, Guantánamo, Israel, and police brutality. Difficulty, for Butler, often remains the point. But the possibility of things getting a little easier is one of the charms of this new world. A project she’s been talking about lately with the psychologist and writer Ken Corbett, a friend, is a new version of Gender Trouble — illustrated, for kids ages 8 to 12.